How do mass customization online toolkits create customer value? In the past decade the rapid growth of the internet enabled companies to provide new value delivering services to their customers. Online toolkits are one successful example of how the internet marketing strategies changes. The possibility for customers to design individual products, which no one owns in our globalized world, offers unique values to all users acting in the electronic marketplace. For years Adidas, Nike and Converse are three global companies, who use the benefits of the technology developments by providing mass customization toolkits to create one-of-a-kind shoes. Have a look at their videos. During the implementation of mass customization it’s important for manufacturers to understand how to deliver customer value and which factors influence the perception of benefits, when using an online toolkit. Therefore mass customization is defined as an interactive process in which customers can choose different features from a set of predefined product modules to design their own most preferred ideal alternative (Dellaert and Dabholkar, 2009). This process is done by the application of online toolkits, which show configuration menus and design kits. They assist the choice making, allow experimentation and visualize the outcome. Due to a sharp focus on online toolkits manufacturers are advised to design their mass customization toolkits in a way that customers experience positive affective reactions and value their functionality (Franke and Schreier, 2010). Franke and Steiner (2010) argue, that the effort and the enjoyment, users experience in the self-designing process are the most important factors companies have to consider. The process to create an individual product is a complex task, since the user hasn’t the professional skills of product designers. An efficient toolkit solves this problem by presenting step-by-step guidelines and reduces the fear of failing. Many time consuming cognitive actions have to be resolved. How is the toolkit working, which possible design modules exist, how many product features can be changed and how much time does it consume for completion. Despite these problems consumers are motivated to use toolkits until they finalize their desired model. Adapted from Jiang, Balasubramanian and Lambert (2014) toolkit providers have to focus on four consumer goals in the decision design process to reduce effort. Keeping the balance between effort and enjoyment from a customer perspective in mind, the use of mass customization toolkits creates five different consumer values (Merle et al., 2010). The companies’ mass customization strategies using online toolkits have to ensure a unique shopping experience to beat the traditional ways of buying. Moreover marketers take into account, that only brand loyal customers use their toolkits. Therefore it’s important to understand the specific bundle of online customer needs (Jiang, Balasubramanian and Lambert, 2014). But what are the differences between the normal and customizing consumers. Even are there any differences? Yes, there are. The toolkit users are individualistic innovators and want to break out of the general mass. They are passionate for the products and brands, unlike traditional buyers, who wait until the next shoe collection is presented. A total identification with the brand is one characteristic of them. They want to be part of the brand and take an active role in the buying process, when designing as co-creators their own personalized shoes. And they are willing to pay much more for their desired outcome (Franke and Schreier, 2010). Nike and Converse offer predefined modules as starting solutions in their online toolkits to keep the effort of accomplishment at a minimum level. In comparison to an attribute-by-attribute configuration, in which customers have to choose each of the product attributes individually from the beginning, the starting module solution is preferred for online shoe designing toolkits. If you imagine to design a new shoe as a customer, where would you like to start? With the detailed and specific materials the shoe components are made of or with the colours and outside appearance. The perceived complexity of an attribute-by-attribute format devalues the benefits of full customized shoes and results in a negative reaction. Although starting customization modules reduce the design process opportunities compared to an attribute-by-attribute format, customers feel more guided and therefore satisfied with the intended configuration results. Providing easy shapeable starting modules to the unexperienced designers creates higher customer values and supports the online interaction by solving the customization paradox between complexity effort and design enjoyment (Hildebrand, Häubl and Herrmann, 2014). Still unanswered and not addressed are the questions how marketers can push their toolkits for more attention, which are the toolkit benefits for a company besides customer value creation or how marketers can use the toolkit data for product innovations and strategy adaptions? From a theoretical perspective Von Hippel and Katz (2002) summarize the following five rules of how effective online toolkits provide customer values. From a practical perspective Spauling and Perry (2013) state their five rules for companies to be successful with mass customization toolkits. Read more about the rules of success on product customization here. Nike and Converse applied these five theoretical and practical rules as you can see in the following self-experiment analysis or do your own shoe design self-experiment! I am a traditional, but also passionate customer of these three brands. I never used one of their toolkits before, why I am going to analyze them now in a personal way according to the aspects mentioned above. Click on the brand logos or toolkit results, which lead you directly to the online pages. Dellaert, B. G. and Dabholkar, P. A. (2009). Increasing the attractiveness of mass customization: The role of complementary on-line services and range of options. International Journal of Electronic Commerce, 13(3), 43-70. Available online: http://www.tandfonline.com/doi/abs/10.2753/JEC1086-4415130302 [13 Feb 2015]. Franke, N. and Schreier, M. (2010). Why Customers Value Self‐Designed Products: The Importance of Process Effort and Enjoyment. Journal of Product Innovation Management, 27(7), 1020-1031. Available online: http://onlinelibrary.wiley.com/doi/10.1111/j.1540-5885.2010.00768.x/abstract [13 Feb 2015]. Hildebrand, C., Häubl, G. and Herrmann, A. (2014). Product Customization via Starting Solutions. Journal of Marketing Research, 51(6), 707-725. Available online: http://journals.ama.org/doi/abs/10.1509/jmr.13.0437 [13 Feb 2015]. Jiang, P., K. Balasubramanian, S. and V. Lambert, Z. (2014). Consumers' value perceptions of e-customization–a model incorporating information framing and product type. Journal of Consumer Marketing, 31(1), 54-67. Available online: http://www.emeraldinsight.com/doi/abs/10.1108/JCM-04-2013-0534 [13 Feb 2015]. Merle, A., Chandon, J. L., Roux, E. and Alizon, F. (2010). Perceived value of the Mass‐Customized product and mass customization experience for individual consumers. Production and Operations Management, 19(5), 503-514. Available online: http://onlinelibrary.wiley.com/doi/10.1111/j.1937-5956.2010.01131.x/abstract [13 Feb 2015]. Spauling, E. and Perry, C. (2013). Making it personal: Rules for success in product customization. Bain & Company Insights. Available online: http://www.bain.com/publications/articles/making-it-personal-rules-for-success-in-product-customization.aspx [15 Feb 2015]. Von Hippel, E. and Katz, R. (2002). Shifting innovation to users via toolkits. Management science, 48(7), 821-833. Available online: http://pubsonline.informs.org/doi/abs/10.1287/mnsc.48.7.821.2817?journalCode=mnsc [15 Feb 2015]. Brand Logo - http://www.adidas.com/ [15 Feb 2015]. Online toolkits: miadidas - http://www.debutart.com/illustration/alex-trochut/my-life-mi-adidas#/illustration-portfolio [15 Feb 2015]. Toolkit result - mi adidas 1 - http://www.adidas.se/customise [15 Feb 2015]. Brand Logo - http://www.converse.com/ [15 Feb 2015]. Online toolkits: converse blank canvas – http://cdn1.milled.com/contents/2014-10-16/1tD3xjEtZs4L7QBA/KJLPyXnfz0yQ .jpg [15 Feb 2015]. Toolkit result - converse blank canvas 1 - http://www.converse.com/landing-design-your-own [15 Feb 2015]. Brand Logo - http://www.nike.com/ [15 Feb 2015]. 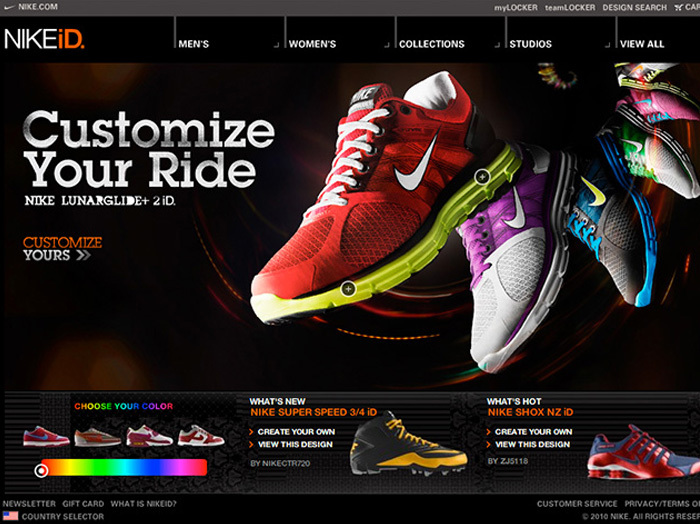 Online toolkits: nikeid - http://payload.cargocollective.com/1/0/10484/707308/nikeID-lunarglide-02_2000.jpg [15 Feb 2015]. Toolkit result - nikeid 1 - http://www.nike.com/gb/en_gb/c/nikeid [15 Feb 2015]. miadidas toolkit – https://www.youtube.com/watch?v=ATu4oO8rAyw [16 Feb 2015]. nikeid toolkit - https://www.youtube.com/user/nikeid [16 Feb 2015]. converseblankcanvas toolkit - https://www.youtube.com/watch?v=Nqe_W932FL8 [16 Feb 2015].